St. John Neumann’s Anne Weller threw a perfect game with five strikeouts to lead Neumann to a 10-0 win over Sullivan County on Monday in high school softball. Weller also had a triple and two RBIs. Sarah Ingerick recorded her 103rd career hit to set a Wellsboro school record in a 10-0, 5-inning win over Canton. Alexis Singer (7-0) threw a 4-hit shutout. Muncy scored the final two runs but it wasn’t enough as it fell to Bloomsburg, 3-2. Sarah Miller and Haley Gyurina each had two hits and a double for Muncy. 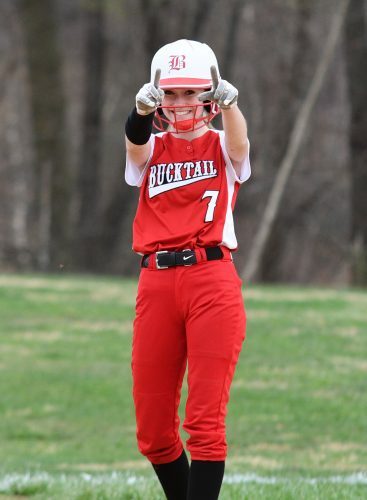 Gabby Shreck had a bases clearing double in the third inning as she ended with four RBIs and Reilly Gearhart and Emily Snyder had three hits apiece but Montgomery lost on a walkoff run, 8-7 to CMVT. Kayla Gee pitched a complete game and added two hits as Loyalsock scored two runs in the top of the eighth inning to defeat Southern Columbia, 6-5 in eight innings. Montoursville had just four hits but South Williamsport committed seven errors as Montoursville won, 7-3. Lexi Marchioni had two RBIs as did Taylor Shuman for Montoursville. Benton scored 3 times in the second and third innings to beat Hughesville, 6-1. In high school baseball, Joe Allen threw a complete-game 5-hitter and Dawson Prough doubled and scored three times in Wellsboro’s 11-1, 5-inning win over Canton. Zach Fry and Nate Hampton had 3 hits each as Hughesville scored 6 runs in the fifth inning and beat Danville, 11-1. In high school baseball, Muncy scored nine first-inning runs en route to a 14-4 win over Bucktail. Jordan King, Nick Palmatier and Gage Bender all had multi-RBI games..
Montgomery scored 10 runs in the first three innings en route to a 11-3 win over Sullivan County. Jensen Drick, Dylan Gordon and Taylor Leblanc all had two hits for Montgomery. Aidan Plants had two hits, two doubles and four RBIs and Abdi Rodriguez pitched a complete game to lead Montoursville to an 8-5 win over Midd-West. Montoursville scored seven runs in the final three innings. Loyalsock clinched a share of the HAC II with its 12-7 win over Central Columbia. Nate Krizan had four hits, two doubles and three RBIs and Andrew Malone had three hits, a double, a triple and four RBIs. In boys tennis, Central Mountain swept all three singles matches to defeat Milton, 3-2. Braden Foresman’s No. 2 singles win was Hughesville’s lone point in a 4-1 loss to Blooomsburg. Quincy Fry, Chandra Thomas (5th) and Torie Shultz. Anne Weller and Makenzie Cannon. W- Weller. L- Fry. Top Neumann hitters: Makenzie Cannon 2-2 2 RBI; Shayna McNamee 2-3 RBI; Anne Weller 1-1 3B, 2 RBI. Evelyn Cattona, Maggie Machamer (2) and Lauren Watkins. Alexis Singer and Sidney Tremper. W- Singer. L – Cattona. Wawroski and Yocum. Kat Ebner and Makenna Snyder.W- Wawroski. L- Ebner. 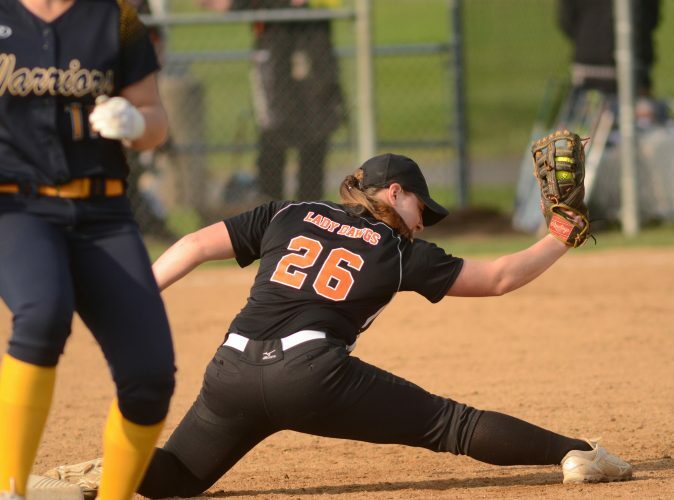 Top Bloomsburg hitters: Luxardo 2-3 Top Muncy hitters: Sarah Miller 2-3 2B; Haley Gyurina 2-4 2B, Kat Ebner 1-1. Hannah Bryson and Amanda Killps. B. Fausey and B. Witchey. W- Fausey. L- Bryson. Kayla Gee and Rhiallie Jessel. Duzick and Johnston. W- Gee. L- Duzick. Anna Steer. K. Dangle, M. Probst (7th). W- Dangle. L- Steer. Top South hitters: Hanna Henigan 2-3 R; Kylie Hauke 1-3 RBI, R; Alana Stugart 1-4 3B, R. Top Montoursville hitters: Lexi Marchioni 1-3 2 RBI; Taylor Shuman 1-3 2 RBI, R.
Top Benton hittters: Shafer 2-4, Huntington 2-4. Top Hughesville hitters: Ritter 2-3. Top Canton hitters: Bryce Coles 3-3 2B, RBI. Top Wellsboro hitters: James Mundy 2-3 2 2B, 4RBI; Dawson Prough 3-3, 3 2B, RBI, 3 runs; Johnny Roland 2-3 RBI. Top Hughesville hitters: Zach Fry 3-4, Alex Welch 2-3 2B; Trevor Gagliano 2-4, Nate Hampton 3-3 2B; Logan Bower 2-3. Top Danville hitters: Klena 2-2, Weaver 2B. Miller, Mason (1st), Knauff (3rd) and Prebble. Hunter Dunlap, Brock Matthews (3rd), Coleman Good (3rd) and Jordan King, Donovan Diehl (3rd). W- Dunlap. L- Miller. Top Bucktail hitters: Spencer 2-4 RBI; Prebble 3-3; Knauff 2-3. Top Muncy hitters: Jordan King 1-1 2 RBI; Nick Palmatier 2-3 3 RBI; Gage Bender 1-2 2 RBI. Hunter Budman, Braden Strouse (4th), Cody Steele (5th), Dylan Gordon (6th), Gage Yohn (7th) and Jensen Drick. Jon Saxe, Will Kriner (5th) and JD Houck. W- Budman. L- Saxe. Top Montgomery hitters: Jensen Drick 2-5 3B, 3 R; Dylan Gordon 2-5 2 RBI 3 R; Taylor Leblanc 2-3 Top SC hitters: John Saxe 2-3; JD Houck 2-3. Abdi Rodriguez and Nolan Ott. Aaron Sharp, Colby Kreider (7th) and Tyler Martin. W- Rodriguez. L- Sharp. Top Montoursville hitters: Brycen Mussina 1-3 2 R; Nolan Ott 1-2 RBI; Preston Shearer 1-1 R; Aidan Plants 2-3 2 2Bs, 4 RBI. Top MW hitters: Aaron Sharp 2-3 R, RBI; Garrett Ulrich 1-3 RBI, R; Matt Ulrich 1-1 R.
Aaron Raemore, David Lytle (3rd), Connor Watkins (6th), Larry VanStavoren (7th) and Eric Holz. Grozzier, Boyd (3rd), Deblin (6th) and Bariler (7th) and Grozier. W- Raemore. L- Grozzier. Top Loyalsock hitters: Nate Krizan 4-5 2 2Bs, 3 RBI; Andrew Malone 3-4 2B, 3B, 4 RBI; Hunter Webb 2-3 2 walks, 3 RBI. Top CC hitters: Grozzier 2-3 2B, 2 RBI; Smith 1-4. 1. Kline Williams (CM) def. Joe Hackenberg 6-0, 6-0; 2. Mitch Whwary (CM) def. Cody Greenaway 6-4, 6-2; 3. Micah Brinker (CM) def. Brent Artley 6-2, 6-4. Frank, Riley Harris (3rd) and Blandon.Eric Wheeland, Zach Toner (1st), Dane Armson (3rd), Max Anderson (5th) and Dane Armson, Eric Wheeland (2nd). W- Armson. L- Harris. Top LEY hitters: Dane Arsmon 2-3 2 2Bs; Logan Ott 3-4 2B, 5 RBI; Hayden Sick 2-4 3 RBI; Carter Sagan 3-4 3 RBI.